I've never started a book recommendation with “Hmm” before, but this book was such a headscratcher, that's the first word (monosyllable?) that comes to mind. Chip, garrulous and friendly (much to Deb's chagrin), makes friends with other guests at the resort in no time, and soon a marine biologist named Nancy confides that she's discovered mermaids swimming around the reef nearby. Events take a turn for the surreal when Nancy's wild claim proves true. What follows is an impassioned battle with the establishment to protect the mermaids and their habitat from exploitation. Deb is one literary character I'd least like to meet in real life, but I admit to smirking now and then as she mercilessly skewered Midwesterners. I love living in the land of wheat and high winds, and would probably end up walking into a river a la Virginia Woolf if forced to live in a densely populated coastal city, but frankly, there are a lot of religious nuts out this way. And they show up to vote, which causes all kinds of havoc. The headscratch-y part of the book occurs in the last couple of pages, when a sudden twist is revealed. And it's not the kind of twist that brings the story together into a cohesive whole; it's the opposite, and pretty much dismantles everything Millet spent the whole book building. It was so abrupt and offhand, I had a moment of reader insecurity and flipped back through the pages frantically, thinking I had somehow missed a prior mention. Nope—it's just a crash-landing of an ending. 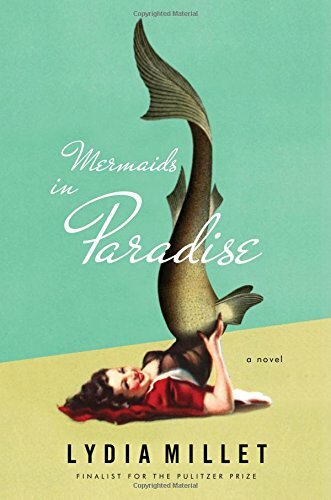 Thus, “Hmm.” Still, I think I liked Mermaids in Paradise. Despite its problems, it made for addictive reading. These days, if a book can both make me think and make me laugh, I call it a win.